Actuarial Post continues to be the fastest growing actuarial website in Europe, attracting hundreds of new subscribers each month. What better media for you to advertise in today's Actuarial market. Prominent display advertising on the main homepage, run of site or dedicated pages on the website ensures maximum exposure for your brand to be viewed by the Actuarial Post’s readership and deliver traffic to your specified landing page of website. Our Creative Team can design and build banners for you at a cost effective prices. Click here to contact us regarding prices and to obtain an example of the banner you require that we will produce for you utilising your logo or corporate branding. 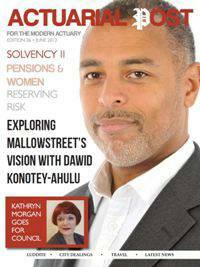 The Actuarial Post Magazine is a monthly magazine with interviews and articles from leading actuarial sources in the market today. Advertising in the magazine offers you the unique opportunity to utilize rich media, if you wish, to add animation, video or music to any full page ad creative, anything that can be viewed on a web site can be incorporated into your ad-creatives. With Banner advertising viewable on every page of the magazine, your advertising can reach a larger audience than ever before in the Actuarial market. Every week we publish Newsletters which are sent directly to the desktops of our readership. We have produced our highly effective In-Line Advertising for client's Seminars and Events advertising in addition to effective Skyscraper and Leaderboard advertising. A dedicated Job Board newsletter is published every week which allows companies to feature their logo and highlight one particular job. Other Newsletters also carry a Latest Jobs section of jobs detailed from our dedicated Job Board. Actuarial Post delivers a targeted jobsite in a unique manner that is unlike any other jobsite in the actuarial marketplace. 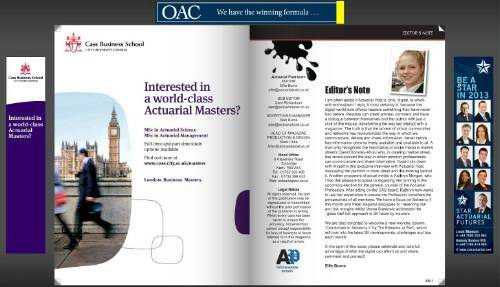 Actuarial Post is aiming to be the leading website in the actuarial field. It is currently viewed daily by a large proportion of the actuarial community every day, looking for information and technical data rather than just jobs. We provide a bespoke service to fit your budget please contact us via email or call us and we will respond promptly to provide you with the pricing information you need.